It's easy to travel with 500W of low-end punch. For those seeking Ashdown tone, power and reliability without the weight the RM-500 EVO II is the solution. Weighing in at just 5.7 lb. (2.6kg) but boasting 500 watts of power, class leading quality and features. 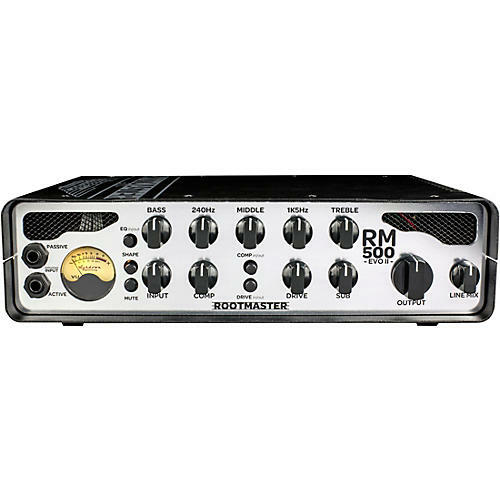 The Rootmaster EVO II range also now comes equipped with an on-board headphone preamp to allow for silent practice, which doubles up these gig-ready amplifiers as handy practice devices. The pre amp includes a passive and active input jack socket for use with high and low output instruments, this sets a clear signal path to the input control enabling you to fine tune your input level using the trademark Ashdown VU meter. With the signal at its optimal level, you then hit the rich features designed enhance your tone, such as the shape button, 5-band EQ and on-board compressor. The drive control, as always delivers a delectable valve emulated over-drive, whilst the sub harmonic controls add further fatness to your tone — both can be foot-switched via an FS 2 foot-switch (sold separately). Rootmaster EVO II heads also features a handy mute button. What’s even cooler is when switched to mute, the trademark Ashdown Engineering VU meter changes from orange to cool blue – creating the perfect on stage mood lighting between sets. Ashdown have upgraded the amp’s front panel with a matte anodized alloy finish, replacing the previous polished stainless steel. This simple, yet observant modification makes reading your amp settings that bit easier when placed under bright stage lighting. No more reflective surfaces. With footswitchable flexibility, Ashdown's tube-emulated overdrive can take your core bass sound and push it into warm overdrive through to distorted filth whenever you need to add extra grind and girth to your tone. If you want to use your favorite pedals or multi-effects, you’ll find send and return sockets on the back panel, along with a DI output for direct injection into the PA mixer or recording console and a Line Input (with front panel level control) so you can jam along with a backing track in rehearsal. A combined Jack/Speakon socket with a minimum 4 ohm load provides flexible partnering options with a dedicated range of Rootmaster EVO cabinets. The Rootmaster EVO II range now comes equipped with an on-board headphone preamp to allow for silent practice, which doubles up these gig-ready amplifiers as handy practice devices. The headphone preamp maximises the full sound potential of your headphones, so now your in ear sound can match the quality of your stage sound. Dimensions: 3.39" x 12.36" x 9.25"